It was the worldwide first dedicated E-Bike helmet anywhere and stands out for style and outstanding workmanship. The E-Motion Cruiser would look right at home behind the wheel of a rallye roadster. The flagship model from CASCO stands out for top wearing comfort. 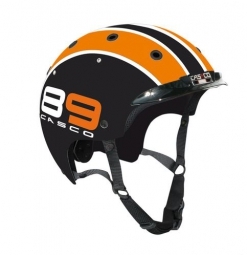 CASCO Casque Ville VAE E.MOTION CRUISER Edition ''89'' Noir Orange clasificado 4.7 de 5 por 3.